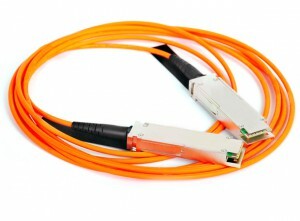 The most straightforward way to connect 100G traffic is by using standard transceivers and there is a wide range of cables and transceivers suitable for this. To offer cost-optimized solutions for connecting switches together in a rack or data center, Ethernet switch vendors want to maximize the density of optical transceiver ports on their equipment. This is so they can offer maximum channel count and lowest cost per bit traffic. 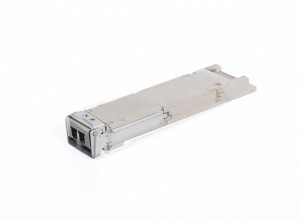 Most of these switch vendors choose the smallest form factor transceiver: the QSFP28 transceiver. 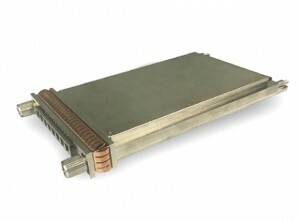 It’s the smallest module available, and has the lowest power consumption among those that are capable of handling 100G traffic. 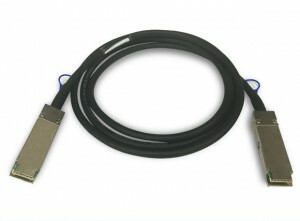 It’s also notable that the QSFP28 has the same physical size as the QSFP+ commonly used for 40G traffic. This means that switch vendors can increase the traffic throughput by a factor 2.5 without the need to redesign the front panel of their switches. Convenient, low-cost method of connecting 100G equipment, with a single assembly instead of three discrete components. Fewer parts are required, but most importantly, using cable assemblies removes many of the problems associated with dirty connectors. DAC (Direct Attached Cables) exist for 0-15m and AOC (Active Optical Cables) up to 70m. AOC cable assemblies provide similar performance to discrete transceivers and fiber cables. 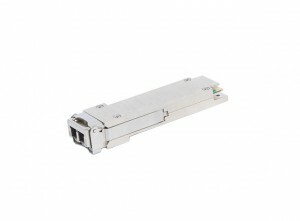 Short-range QSFP28-SR4 transceivers support connections of up to 100 meters over multimode fiber. This approach is similar to using AOC cables, but here it is possible to use structured cabling. They use more expensive non-standard MPO (multi push-on/pull-off cable) connectors which cancel out some of the cost savings of the transceiver. Long-range QSFP28-LR4 versions support connections up to 10km over singlemode fiber. They use standard LC connectors and use existing structured LC cabling. This is all great news for switch vendors who need to handle data that stays within the rack and the data center. For these scenarios, the QSFP28 offers the perfect fit. It only becomes a problem when 100G traffic needs to be transported over long distances, as in the case of providing 100G data center connectivity between different geographical locations. For long-distance connectivity, there are a number of form factors available. The CFP and CFP2, for example, offer DWDM Coherent technology and enable multi-channel long distance connectivity of more than 1000km. But the CFP is large; it’s too big to be used in an Ethernet switch in volume. Even if a vendor chooses the smaller CFP2 or CFP4, the size and power are still unnecessarily – and often unrealistically – high. One solution is to offer CFP DWDM support for those few links where it’s required, but even there, the increase in power consumption and the decrease in available ports have an impact on the overall cost-effectiveness of the switch. 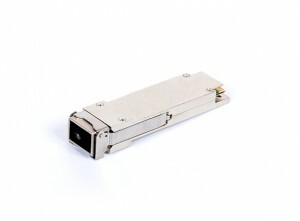 The QSFP28 is still the smallest 100G transceiver. It’s a fraction of the size of the CFP, and is perfect for short distances. For longer distances, there have also been some recent breakthroughs in transceivers with DWDM capabilities, most significantly the PAM4 . To be effective, however, the PAM4 requires amplification for even very short distances, and for any distance over 5 or 6km, needs dispersion compensation. With this, it can handle data traffic up to 80km. While the range of choices for connecting 100G traffic is growing, no single small transceiver can solve the problem of connecting switches between data centers or other distant sites. That’s why it’s not uncommon for organizations to consider full-blown, telecom-grade DWDM platforms to handle their 100G data center connectivity. 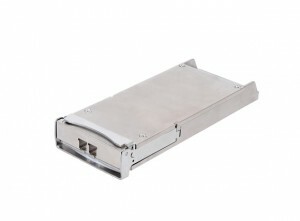 These platforms take the output of the QSFP28 transceiver and run it through a complex web of transponders, amplifiers, signal conditioning, multiplexers and network management. It works, but these platforms are designed for the telecom, not the datacom world, which means they’re incredibly complex, and usually far overspecified for what are relatively simple traffic demands. But more importantly, they’re expensive, pushing the capex and opex for these systems far outside the range of what a corporate data center should need to spend, especially when DWDM is only required for a small percentage of standard Ethernet switch connections. The ideal solution would allow best-in-breed 100G switches and routers to be used within the data center, with low power consumption and a maximum port count – with a low cost per bit. And then, for those occasions where traffic from these switches and routers need to be connected over longer distances, or over a DWDM network, there should be a solution that is simple, easy to install and operate, and cost-effective to own and run. For a corporate data center, none of these are terms that could be applied to a solution designed for telecom systems. The solution that offers the best of both worlds allows the user to get the full benefits of QSFP28 transceivers in the datacom equipment, but also gets the advantages of telco-quality traffic transportation between sites. The Smartoptics DCP family is built exactly for this purpose. These modular, plug-and-play, low-powered transponders and muxponders can be placed close to the switches whose traffic they need to transport. They’re designed on an open networking philosophy that enables transponders and embedded DWDM to be used together with embedded DWDM transceivers, depending on the specific requirements of each network. Rather than use expensive workarounds of products designed for huge telecoms carriers, corporate data centers can now use much simpler, plug-and-play solutions that are flexible, scalable, and designed to meet their needs. For more on using QSFP28 transceivers for data center connectivity without sacrificing long-distance traffic needs, download the Smartoptics guide to simplifying 100G DWDM connectivity.